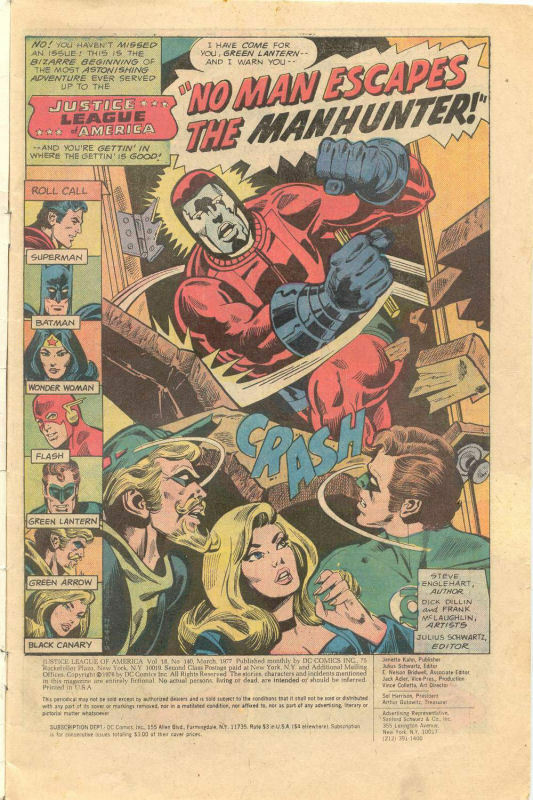 Writer Steve Englehart had come over from Marvel the issue before, bringing a Marvel sense of characterization to his JLA stories which would continue to develop over the coming issues. 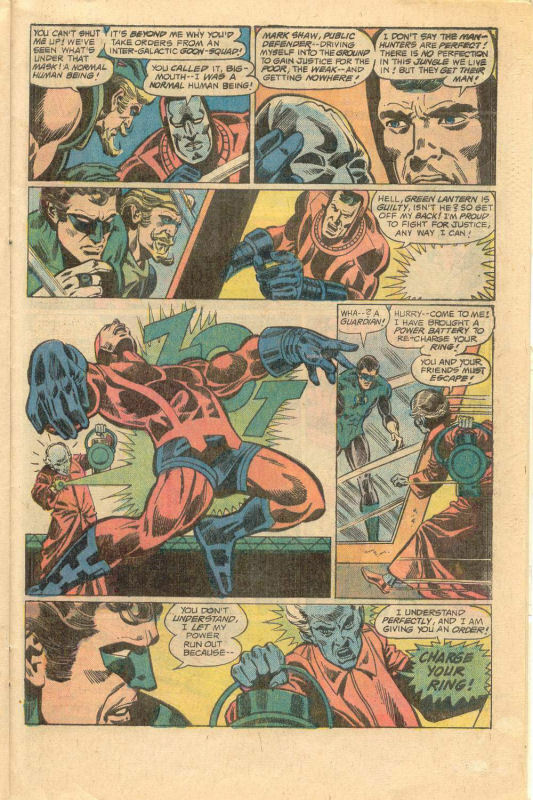 To that, with this issue, he added a Marvel sense of continuity–this entire storyline turns upon taking a failed Jack Kirby launch for a new iteration of Manhunter and tying it into the origins on the Green Lantern Corps. It was an effective trick, of a kind that didn’t typically get showcased at DC, where continuity was still an iffy proposition. The story opens at Bruce Wayne’s midtown penthouse, where Green lantern, Black Canary and Green Arrow happen to be, and where they’re attacked by the aforementioned Manhunter. GA and BC are quickly subdued, and GL gives himself up–and even the appearance of the Batman (who has, no kidding, been standing on the roof all the while this fight was happening) can stop him from making off with the hard-traveling heroes. Manhunter does confirm for Batman that he is related tot he Archie Goodwin/Walt Simonson Manhunter as well, another continuity piece looped together. Superman and Wonder Woman arrive in time for Superman to grab a piece of Manhunter’s teleporting craft, and the Flash is summoned to track its particular vibrational pattern. 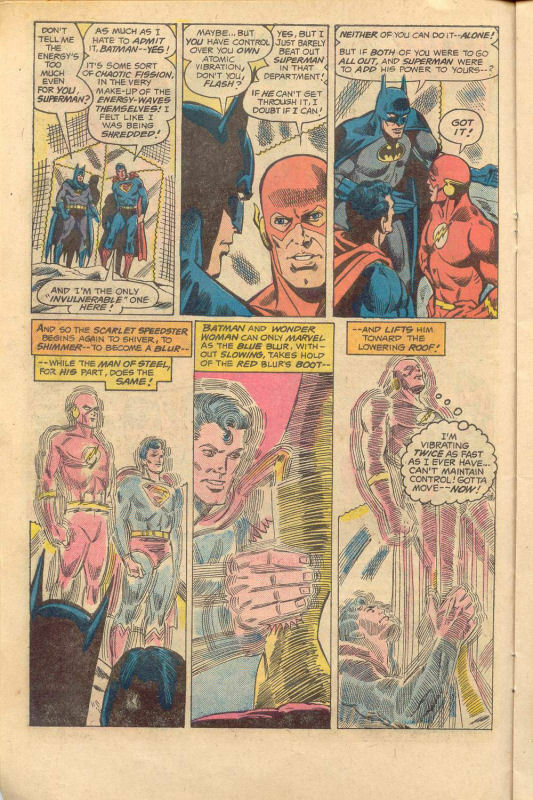 Flash is able to track Manhunter’s teleportation to Nepal, which is where the story transitions to next, as Manhunter reveals himself as fallible former prosecutor Mark Shaw before the order’s Grandmaster–no Manhunter up until this time has ever left a trace, so in revealing their existence to the Justice League, he has failed their order. The groggy Green Arrow and Black Canary make a break for freedom but are foiled–and Green Lantern doesn’t help out at all. 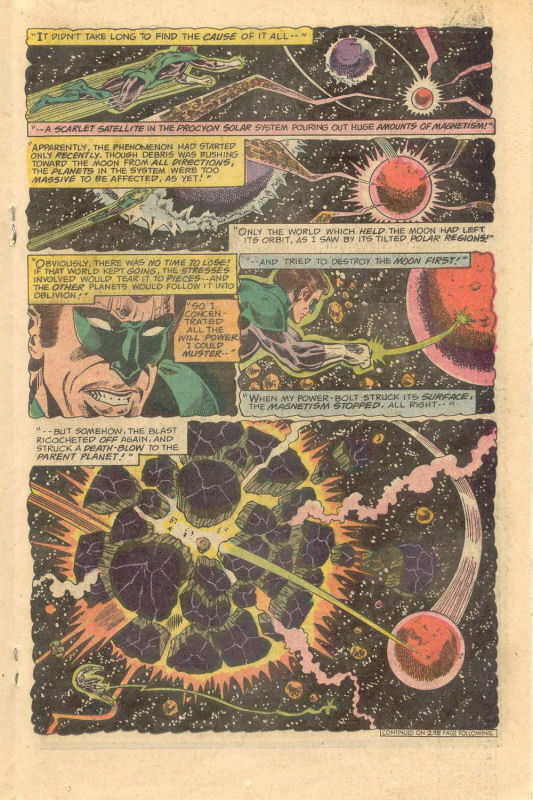 In fact, his Power Ring is uncharged, and when the Manhunters accuse him of a cosmic crime, his is strangely silent. Following the trail to Nepal, Superman, Batman, Wonder Woman and Flash are ambushed by the Grandmaster, and imprisoned in a shrinking energy box that even Superman cannot break free of. 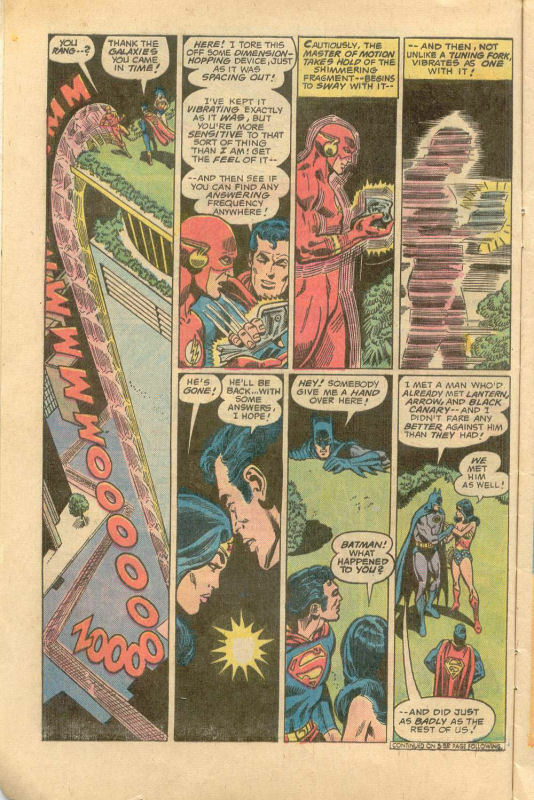 But in typical JLA style, Superman and Flash combine their speed powers, accelerating Flash past his previous limits of vibrating such that he can slip between the molecules of the deadly cube and then secure their escape. 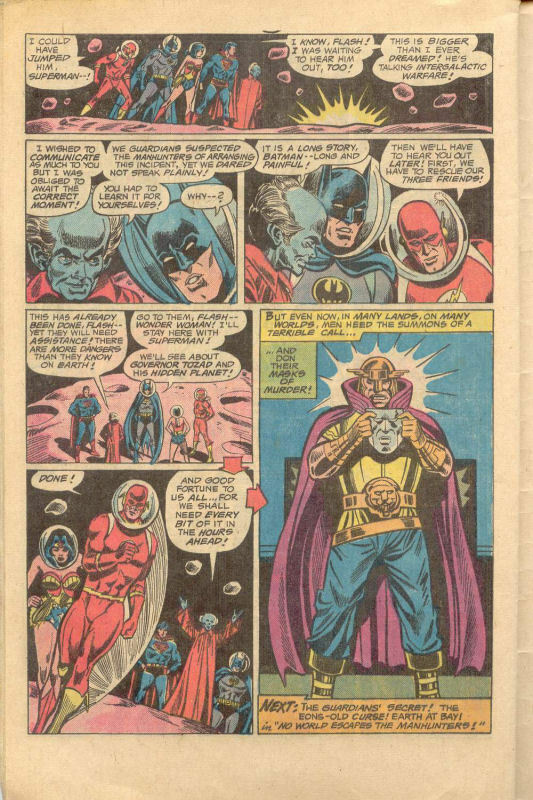 The Grandmaster reveals to the liberated JLA that the order of the Manhunters are agents of justice, bounty hunters who for centuries have plied their trade across the cosmos. And now they have come for Green Lantern, for the gravest crime of all. And so it’s time for Green Lantern to reveal his crime–a crime for which he intends to resign from the Justice League and give up his badge as Green Lantern. For the previous day, in attempting to protect a planet in his space-sector from a meteor shower, something went terribly wrong, and instead the Lantern’s power-beam was reflected off the target moon and had destroyed the planet Orinda itself and all life upon it. 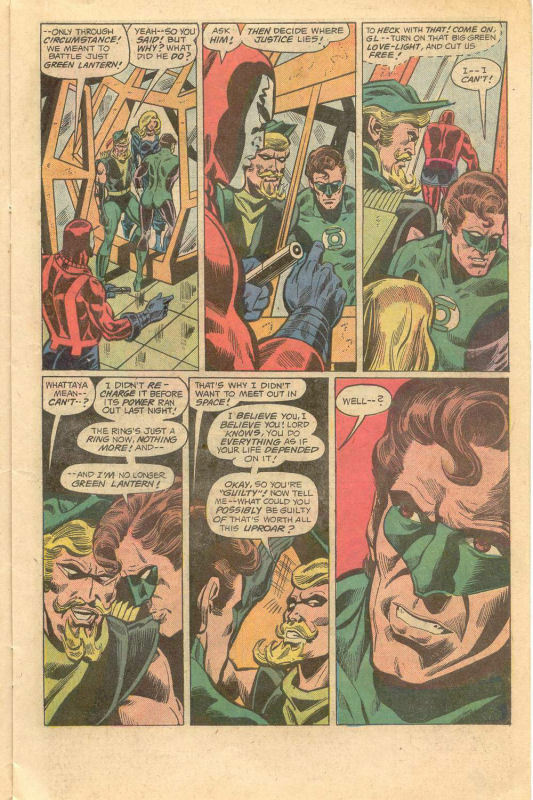 The JLA is skeptical of this account, and the Grandmaster gives them some time to collect evidence of Hal Jordan’s guilt or innocence–but not very much time. Leaving Green Arrow and Black Canary behind with Green Lantern as hostages, the JLA journeys out into space to the moon of Orinda looking for answers. There, they find a member of the Guardians of the Universe under attack by an angry mob–the Guardians created and oversee the Green lantern Corps, and so the populace of the moon of Orinda blame him for the planet’s destruction. 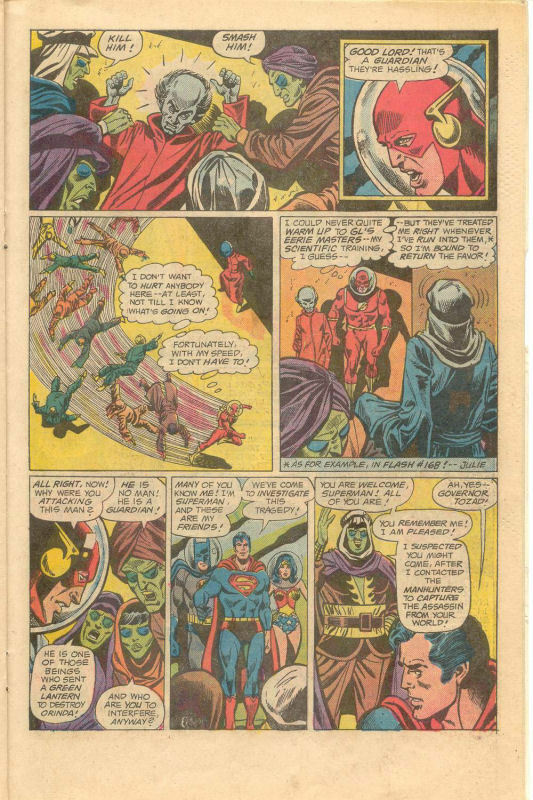 The JLA comes to his rescue, and then the group briefly powwows with Governor Tozad of the moon colony, who reveals to them that the Manhunters are known at the highest levels of government across the galaxy. Together, the group heads out to check out the desert area of the moon, where Green lantern’s power-beam would have struck. Back on Earth, Green Arrow trades barbs with Manhunter Mark Shaw, until another Guardian appears in the room. This new arrival blasts Shaw into unconsciousness, frees the three JLA members and insists that Green Lantern recharge his Power Ring with the power battery he has brought with him. Despite GL’s protestations, the Guardian insists that more is going on here than GL realizes, and that the trio must escape the Manhunters and avoid their pursuit. Reluctantly, the guilt-stricken Green Lantern blasts his teammates to safety. Back on the devastated moon of Orinda, the Leaguers find themselves attacked by a mythological creature, a Magnosaurus, and the powers of Superman, Wonder Woman and the Flash prove useless against it. It’s Batman who figures out the game–the Magnosaur isn’t real, it’s just an illusion. What’s more, the fact that the Moon is still in a stable orbit indicates that Orinda must still exist and just be cloaked from view. But who or what could cause that? It’s the Guardian who provides the answer, by revealing that Governor Tozad himself is one of the Manhunters, whose aim, it seems, is to discredit the Guardians and the Green Lantern Corps. And now that their secret is out in the open, it means open warfare between the Cult of the Manhunter and the Justice League of America. And that’s where this installment ends, in a To Be Continued! 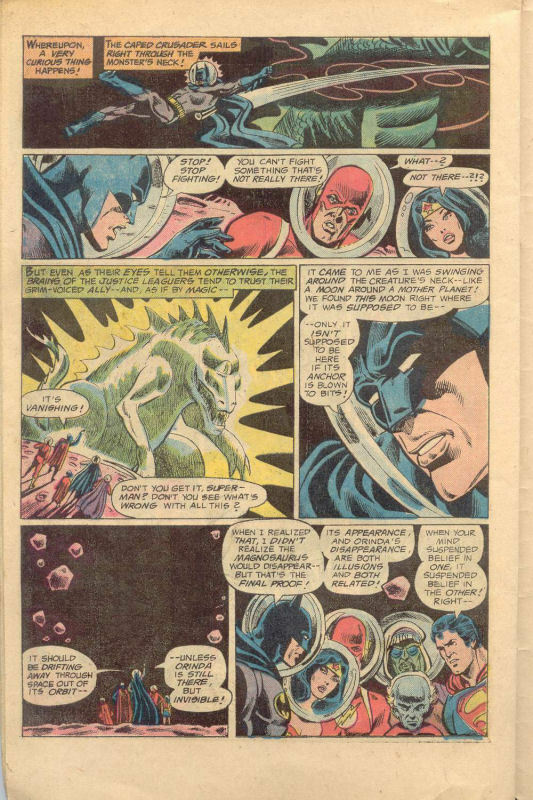 But that wasn’t quite the end of the issue, as after the letters page came the inaugural edition of a new regular feature, showcasing what was going on 100 issues earlier in JUSTICE LEAGUE OF AMERICA. 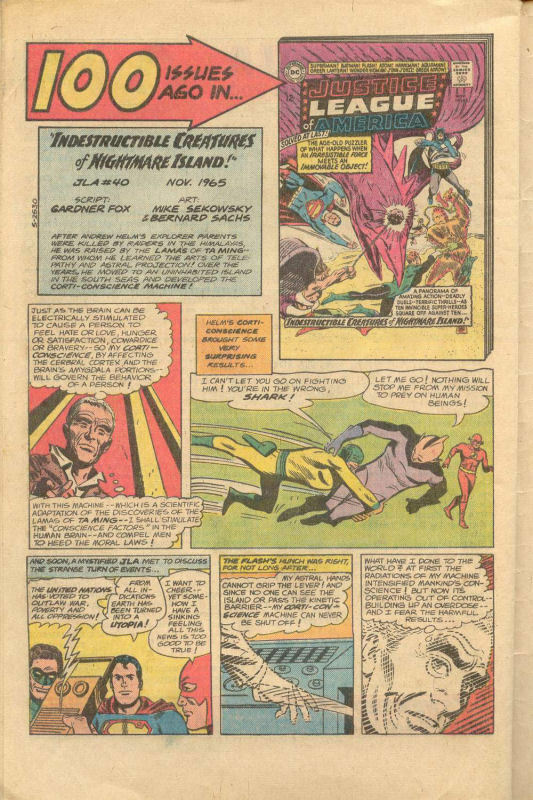 Because I was hugely interested in the history and earlier stories of these characters, this feature was my meat–and this short two-page recap of JLA #40 from ten years previous was simultaneously intriguing and imagination-spurring. I loved these two pages almost more than the rest of the issue, to be honest.